This book is a compilation of Declarations, Plans of Action and ECOSOC Resolutions which make logical, practical, humane and cost-effective recommendations for penal reform, written specifically in and for the African context. Where implemented, these can reduce the unnecessary use of imprisonment and improve access to justice, while responding to the special needs of those prisoners who are particularly vulnerable and respecting the rights of victims. 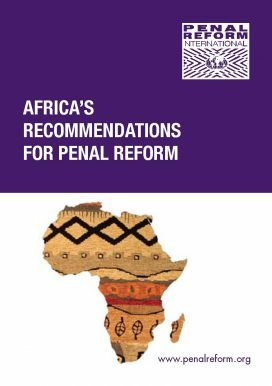 It is hoped that the texts contained ion this publication will inspire to practical action those working for penal reform in Africa, and indeed, beyond.